GatorCountry brings you a new podcast as this time we discuss Mike White’s Florida Gators basketball team. 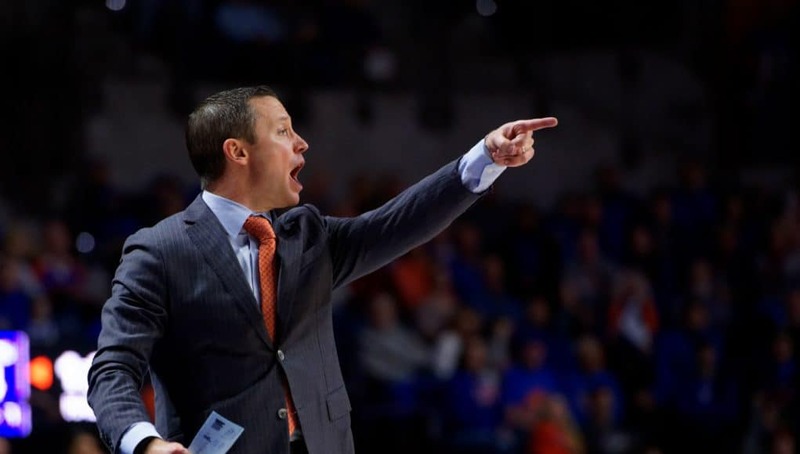 Andrew Spivey and Eric Fawcett talk about how Mike White has landed one of the Gators best recruiting classes in the history of Florida basketball. 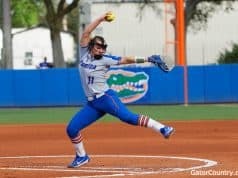 Andrew and Eric also discuss the upcoming season for the Gators and Eric gives us his starting line-up and keys for Florida this year. Andrew: What’s up, Gator Country? Your man, Andrew Spivey, here with not Nicholas de la Torre this time, but my man Eric. Eric coming on and talking some basketball. Eric, it’s your time of the year again, my friend. Eric: It is. It’s something I’ve been very excited for, since the spring. I’m super excited to talk some basketball. I am very happy that the football team is doing great. It’s giving you guys lots of time to talk about that. It’s great that we have a chance to talk some basketball, because it’s less than a month away. Andrew: When’s the first exhibition game? Two weeks, week and a half? Eric: There’s kind of the secret scrimmage, and then there’s going to be, I think it’s October 30th there’s an exhibition, and then it’s November 6th or 7th. I shouldn’t be blanking on this, but I am. That will be the game against Florida State where we kick it off with a bang. No more of this getting some small mid-major team to kick off the season. It’s on the road at Florida State. Andrew: I like that. I don’t know about you, but I love that. I like that kicking it off and just going at it and getting it going. Let’s first talk some recruiting. You were one of the few people that I know and follow that had told me from the beginning that you felt good about where Mike White was going to be in recruiting. You felt like his staff was good, that kind of stuff. It’s paying off. You got two five-stars and a four-star. More so than that, the hype around the team. What has changed for Mike White, if anything, or is it just simply the success in Gainesville has led to this? Eric: I think he needed to just wait until he had some success at the school before you kind of expected him to recruit these guys. Obviously, the fact of the matter is he’s still a really young coach. Coming from Louisiana Tech right to Florida there’s not a lot of reason for a five-star kid to go play for him. I can understand why he had, it’s not even like he had a slow start. He was doing good in his first classes, relative to what he was with the transition. I think that that’s just something that people have to remember. He did need to establish himself. If you had a son or a daughter that was a high level power five Division I athlete, would you want them going to a coach that had just transferred up from mid-major to a high major? You’d want to wait and see what they were up to. This is one thing that I think is good. Every one of his classes since he came to Florida has been better than the last. He’s only gotten better. The team has been great on the floor. He obviously has kind of punctuated it with an incredible class for this upcoming season. I mean, one thing, and I don’t mean this at all to talk down about Billy Donovan, obviously, but a lot of people look at this class that Mike White has coming for 2019, and a lot of people were like, now Mike White finally has this thing back to where Billy Donovan had it. The fact of the matter is Billy Donovan only had one class that was better than the one Mike White is bringing in. Mike White is now recruiting, at least this class, it’s as good as the best class Billy Donovan ever pulled in. It’s not only like he’s bringing it back to Billy Donovan’s level. He might be setting the tone on his own. Andrew: For me, like you said, it’s improved. Last year was nothing to sneeze about. You had the five-star in Andrew Nembhard, and then you had the two four-stars that were highly rated guys as well. It’s improved. I think the thing for me, Eric, is what Mike White has done now is he’s kind of set that consistency that Billy Donovan did. They’re going to be consistent in landing good players who not only have ability to play but are also very team guys. I think that’s the thing that I’m learning the most about Mike White. I’m with you in that this might be the best class that Florida ever has. Eric: The recruiting rankings, and I wrote about this, it’s kind of the more players you have. It’s a little bit more of quantity over quality. There’s a class that was rated higher, but it had a bunch of four-stars. It didn’t have any five-stars, but because it was five top 100 people that were low in the hundred, it was rated higher. To me, a class where you have two five-stars, like Tre Mann and Scottie Lewis, that makes it kind of higher, and a really high four-star in Payne, who might be a five-star by the time things are all said and done. I really do think this is going to be the best class Florida really ever has had when you kind of look at the talent at the top. Andrew: I think the thing for me, Eric, is the competition those guys beat for these guys. When you look at Payne, and even Scottie Lewis, just the overall teams they beat for these. The beat the blue bloods for a lot of these teams. Scottie Lewis was Florida or Kentucky. Most of the time Florida loses that battle, but they didn’t this time. I think that’s a big thing. How much do you think his coaching staff and the new addition to the staff really paid off with the guy, especially like Omar Payne? Eric: I think if you’re Omar Payne you want to look at how you can be developed best. I think Al Pinkins is one of the best front court coaches, best developers of big men in the country. Omar Payne has amazing physical gifts. He has really good defensive IQ, but he’s not very highly skilled offensively. If he’s looking at himself in the mirror and kind of looking at himself realistically, he probably knows he needs some good coaching on the front court. He sees that Al Pinkins is there, and that could have been a big piece that helped the Gators land him. I think just how young the coaching staff is, I think that’s really helping them in recruiting. I think if you’re a 17-year-old kid, and you look at how old some of the other coaching staffs are at a lot of the other programs, and then you see Jordan Mincy and Darris Nichols and Mike White, young guys that can still go head to head with them in a scrimmage game if they wanted to. I think there’s something there too. Obviously, they’ve got it going. They’ve got the right guys when it comes to recruiting, because they’re getting the guys they want. Andrew: If you were breaking down these guys, is there a guy, for instance with Scottie Lewis, we’ll start with him, that you can kind of compare him to? For me, when you look at his height and length a little bit, he’s got a little Devon Robinson, Corey Brewer type in him. Is there a guy you kind of compare him to, right off the bat? Eric: He doesn’t quite have the size of those two guys, but I would say he’s pretty similar, he’d be more similar to Corey Brewer, just with his ability, just the speed he can run around the court and his jumping ability. If you ever watch some of his games, it’s not just his monster dunks that are kind of all over Instagram. It’s the fact that he blocks a ton of shots and gets two hands up on the ball and just grabs it out of the hands of someone trying to dunk on him. He’s just a ferocious competitor. I think, to be honest, he reminds me a lot of another Scottie, and that’s Scottie Pippin back, obviously, with the Bulls. Just a guy that wasn’t super skilled offensively, and that’s something I don’t actually think Scottie Lewis is a super kind of polished scorer right now. That’s probably just the one part of his game he isn’t excellent at. I think he’s excellent at just about everything else. That’s someone he reminds me of. I think that’s something for Florida fans to remember, I don’t think he’s going to be a massive scorer at Florida. I think he’s just going to be a guy that defends the heck off someone, and he’s going to rebound the ball and run hard in transition. Just do all the little winning things. He’s not a guy that’s going to put up 20 points very often, but he’s really going to help your team win in a lot of ways. Andrew: 29.9 points is okay. Eric: That will work too. Andrew: What about Tre Mann? Florida’s had their share of talented point guards. Little bit of a taller point guard in Mann. He’s a guy, he’s quick. He’s a very quick guy. Anybody that fans can start to kind of compare him to? Eric: Honestly, the way he scores the ball is a little bit like Brad Beal. Obviously, he is going to be the point guard, which Beal wasn’t really. That’s something that Tre Mann is that we haven’t really had at Florida in recent history. He’s going to be a point guard, but he’s kind of a score first guy. He’s just so smooth on the perimeter. He’s such an electric scorer. He can pull up from anywhere, or he can get to the rim and finish through contact, because he’s got good size and length. That’s going to be something that’s going to be different for Florida. Even with Chris Chiozza and Kasey Hill and Scottie Wilbekin, those guys didn’t really put pressure on the defense with their scoring ability. They had to pass the ball and set things up to be effective, where Tre Mann the moment he crosses center teams are going to have to think about how they’re going to guard him. That’s going to totally change the complexion of the offense, where they can’t just assume, like a Chris Chiozza, when he enters the offense teams are thinking, what’s the first pass he’s going to make? With Tre Mann, it’s going to be is he going to pull up for three, or when he comes off this pick and roll is he going to shoot a three or is he going to hesitate a big man and get in the paint? It’s just going to totally change the complexion of Florida’s offense, and I’m very excited to see it. Andrew: Would you say, you hear comparing him to Andrew from the past class, what would you say kind of the comparison is there? Both are very similar in stature. Eric: They’re definitely similar in stature, but their mindset is definitely different. Andrew Nembhard is a pass first guy 100%, and Tre Mann is a guy who wants to score first. That’s also, if Andrew Nembhard sticks around, doesn’t go to the NBA after one year, they can play in the back court together, and that can be two point guards who can both handle the ball, both who have good enough size to guard on the perimeter, and to see Andrew Nembhard finding Tre Mann off screens, that would be a pretty sight. It just gives the Gators a whole lot of options. Andrew: I think nobody is going to complain if Andrew stays. Andrew: As far as Omar Payne, listed as a center. Only 6’9” though. Do you think he’s a guy that does end up staying slotted in that five spot, or is he more of a four? Eric: To be honest, I see him as more of a five. Honestly, his measurements are almost identical to Kevarrius Hayes’, where he’s kind of 6’9” with like a 7’3” or 7’4” wingspan. I’ve seen different places. That’s pretty much identical to what Kevarrius Hayes is measured at. As we know from the last couple years, Kevarrius Hayes doesn’t have excellent size as a center, but it’s good enough. You hope maybe Omar Payne bulks up a little more than that. Like I said skill wise earlier, I don’t think Omar Payne brings a lot offensively right now, so I’m not sure if I ever really see him playing the four, because if he’s playing the four, and you have maybe a more traditional center on the floor with him, that’s not a lot of floor space and not a lot of shooting. If you play him next to an Isaiah Stokes maybe, where Isaiah Stokes can really stretch the floor. Isaiah Stokes has that kind of bulk he can guard someone down low on defense, and Omar Payne definitely has the foot speed to play out on the perimeter. I could see that, but I think I see Payne more playing the center position throughout his time at Florida. Andrew: Okay. Last thing for you, is this class done? Eric: That’s a great question. You know what, I don’t think the class is done until I see CJ Walker signing with someone. If he takes it all the way to the spring, I think Florida is going to stay in the mix. That’s kind of a little bit of what I’m hearing. Until he signs on the dotted line somewhere, I think you’ve still got to stay in the mix, if you’re Florida. Obviously, I think there’s a chance that Andrew Nembhard goes pro. I think there’s a chance that Keith Stone goes pro and opens up a scholarship, because they are maxed out right now. I think we could see a transfer out. That wouldn’t shock me whatsoever. CJ Walker has got a couple of his buddies on the team right now, and I think that we can see kind of maybe coming to the Gators if he decides to come out late. The other thing too is if you look at CJ Walker’s final schools, every single one of them was named in the current FBI case going on in the courts, and that might be why he hasn’t signed anywhere yet, because he’s trying to wait and see what is going to happen with that. If suddenly all the head coaches of his final schools are implicated in this FBI probe and start losing scholarships or get banned from the NCAA Tournament for a couple years, that could definitely put Florida back in the mix. I think it’s probably done, but I’m not quite ready to seal yet. Andrew: If CJ Walker goes to Florida, this is the best class Florida has ever landed. Eric: Without a question. Like I said, I think this is, in terms of rankings, it’s probably the second-best class right now. I personally think when you look at the rankings, like look at the numbers of the players, I think Florida’s the best, but if you add CJ Walker, who’s probably going to be a five-star, it’s far and away Florida’s best class of all time, at least in the era of when they’ve been doing recruiting rankings and the star system and all that. Andrew: This is the thing that I will say. I kind of look at classes in two different ways. I look at it as when they come in, and then how they finish. Nobody can question how that ’04 of Noah, Brewer, those guys. That’s why I think you maybe take into consideration that a little bit. If CJ Walker goes, I don’t even know if can question this. Eric: No. 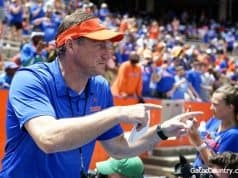 I think that’s something that when I was writing about how I think this might be Florida’s best recruiting class, I was very careful to make sure I said just from a recruiting standpoint I think it’s the best, because I’m obviously not ready to say this team is going to be better than the ’04 because they’re a better recruiting class. I think they’re going to be better than the 2010, the guys that went to the Final Four in 2014, because they’re recruited higher. I do, obviously, separate that a little bit. I’m like you, obviously, when you look back at recruiting classes. Do I think that this recruiting class is going to win back to back national championships? I don’t. Also, because I don’t think that all those guys are going to be around for two years even. From a recruiting standpoint, it’s a deadly class. Andrew: Let’s move on a little bit. We talked about the season getting underway. Early outlooks just on the season. How do you think the team is? Do you think they’re improved a ton from last year? Just overall season preview of this team. Eric: It looks like everyone is going to be healthy for Day 1, which is really good. Gorjok Gak, that’s someone who I don’t think many people expected to be healthy to start the season, just because he hasn’t been healthy his entire career. It’s looking like he might be healthy. The other thing too is now that Florida has Chase Johnson and Isaiah Stokes healthy and playing, if Gorjok did need to take some time to still recover, it’s not like he would need to be forced into service. Last year he wasn’t totally healthy, but the team needed front court bodies, so they put him in there. 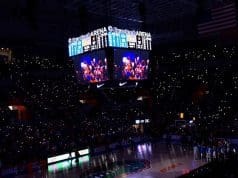 It’s looking like Florida is going to have 13 players that already active, ready to play, and probably deserving of minutes, because if look at the team, all the players that played last year, you could probably say they’re deserving of minutes because they played last year, and then you look at all three freshmen. They’re going to be deserving of minutes, and then Coach White has continued to say that in all of his press conferences. Then Isaiah Stokes and Chase Johnson, I think those could be, Chase Johnson might be the first guy off the bench in a lot of games, and Stokes is going to play too. I think you might see just a total log jam of minutes at pretty much every position, other than point guard. That’s a good problem to have after a team that didn’t have a lot of depth last year, to have the opposite, to have too many bodies, that’s a problem I’m pretty happy to have. The schedule looks awesome. It’s a tough schedule, but I really like that. I think this team probably establish Andrew Nembhard as the starting point guard, though it hasn’t been said officially, and probably won’t be said officially until the ball is tipped against Florida State. The front court, sorry, the starting lineup is going to look awesome with KeVaughn Allen, who’s obviously a senior, and Jalen Hudson, who’s a fifth-year player, and Keith Stone, who’s a redshirt junior, and Kevarrius Hayes, who’s a senior. That’s a good-looking senior group of players that has been battle tested. Those are the kind of teams that win you a lot of games, and also win you games in the NCAA Tournament. When you see that they’ve got a really solid veteran core, and then some really talented young pieces off the bench, like Chase Johnson and Isaiah Stokes, and I think Noah Locke is going to fill things up from the outside, and I think Keyontae Johnson is going to defend at a high level on the wing, which is something we didn’t have last year at all. We didn’t have a lock down kind of wing defender. I think Andrew Nembhard is going to pass the ball just as well as Chris Chiozza did, which people might think is crazy, but I think it’s the case. I’m really excited for the team, and I think that they’re better than last year. I think that they’re more talented. They’re more athletic, and they’re a lot deeper. If last year’s team was just made it to the round of 32, like they did, and were really close to making a Sweet 16, and this team is I think a good step better, I think that puts this team back in the Sweet 16, Elite 8 category kind of easily. Andrew: When you look at this team, we talk about the depth there, how much, I guess, interchanging lineup can Mike White have? That’s something you also saw last year, where he would have times where he would just go small, and then he would have times where he would go to more of a bigger defensive lineup. Is that something you can see again with this team coming up? Eric: Yeah. I think you’ll see it actually a lot more this year, because I think last year they’d have to go small out of necessity, just because they didn’t have a lot of front court guys. They would need to go play Koulechov at the four. This year, I think you’re going to be able to play a lot more different lineups, because you want to. Just because you have guys now like a Chase Johnson that could play the four or the five, or even probably the three if you really wanted to. They say they might play Isaiah Stokes at the four. I don’t totally see that, but you could. Obviously, I think he can play the five. Keyontae Johnson, he’s a guy you could play at the two or the three or the four. Andrew Nembhard, you could play him alongside Okauru or alongside Locke. If they wanted to play really big they can play Jalen Hudson at point guard and go really big that way. You do have a lot of versatile lineups. With the amount of bodies they have now, it’s versatile because they want it to be. Last year I think they were forced to. They played big because they only had kind of big players available to play, or they had to go small because they didn’t have any of their big men healthy. This year you’re going to see them create some really interesting matchups that are going to be tough for some teams to kind of hand in hand with. Andrew: The thing for me, Eric, and, again, I think that a lot of people underestimate this, but this is a team that’s going to be very leadership driven. We talk about KeVaughn Allen, Jalen Hudson. Kevarrius Hayes is another guy. Even Keith Stone is another guy. All these guys who have been around the program, they understand the expectations. They understand the grind it is. I think guys like KeVaughn Allen and Jalen Hudson never would have expected to be at Florida now as seniors. Am I overthinking that, that the leadership that those guys can bring and the experience they can bring is underrated? Eric: I totally think it’s underrated. If anyone wants to look more into that, just look at the NCAA Tournament every year, and look at the teams that aren’t even the most talented but have veterans. Those are the teams that win. Even look at the way that Duke and Kentucky and these kind of young gun teams have not done well in the tournament in recent history. Experience really matters. Leadership was also something that kind of Coach White was talking about lacking a little bit last year, and then this year he’s already talked a lot about the leadership being better and has even gone as far as to say that the freshmen have provided a lot of leadership, which is something he wasn’t used to. With Andrew Nembhard, he said Andrew Nembhard was showing great leadership, and Noah Locke and Keyontae Johnson were some of his most accountable guys. When you get leadership from your veteran guys and also have someone like Andrew Nembhard, who doesn’t have the experience but is kind of a leader on the floor as a point guard, that stuff does matter. Florida lost a lot of tight games last year. They lost a lot of one-possession games, and that was heartbreaking. I think a lot of that has to do with when you don’t have leaders on the floor, you don’t have guys that have kind of seen the battles as much. You start to lose those tight games. Now that you’ve had a year more experience for these seniors and you have some younger players that show leadership, that’s going to help you in those close games. I think Florida lost like five games by one possession last year, which those are essentially tossups. I mean, if Florida wins two or three of those and gets two or three more wins, that probably is a seed or two in the NCAA Tournament that that cost them. Like you said, I think it’s underrated. Andrew: When you look at this conference now, as we kind of expand here a little bit, always Kentucky. Kentucky is always going to be that team that is going to battle Florida. Give me another outlook overall of the conference. Do you think Auburn is going to be able to be back again with all the trouble brewing up on the plains? Eric: They have a couple guys that are now active that couldn’t play last year in Wylie and Purifoy, who were supposed to be two of their best players, at least from a recruiting standpoint and talent wise. Those guys are going to be able to play. Eric: That’s kind of just the thing, I guess, about the court process they’re going through. That takes a lot of time. I guess Bruce Pearl, he got an extension, so clearly with they’re okay with him at Auburn, I guess. They also lost Mustafa Heron, who’s one of their best players, who transferred out. They’ll be really interesting to see. Tennessee was a great team last year, and they bring pretty much everybody back. They didn’t really graduate much, so they’ll be tough. The SEC is just so good. Not only are they good at the top, but look at the teams at the bottom of the league from last year. You see Vanderbilt, and they’ve got two top 15 players coming in their recruiting class, which is just crazy that Vanderbilt has two top 15 players in a recruiting class. Then you see Ole Miss hires Kermit Davis, who’s one of the most sought after coaches to make the mid-major leap to the power five. I think they get better just with that coaching hire. Georgia gets Tom Crean, another coach that was really highly sought after. He had a lot of power five jobs and was just waiting for the best one. He got the one he liked at Georgia. You see that even the bottom of the league, the teams that weren’t good last year, got a lot better. Not going to be many easy games ever in the SEC. Andrew: Key games for Florida this year? Their out of conference is nasty. The conference, like you said, is nasty. What are some key early games for Florida? The Florida State game will be a key, but what are some key out of conference games? Eric: Florida State is one you just have to win, because Florida State has just been crushing the Gators head to head. So far it hasn’t kind of bit them when it comes to recruiting, because Omar Payne, he was kind of down to Florida State and Florida in a lot of ways. Tre Mann was involved too. If Florida State keeps beating Florida head to head, I think that might start to catch up to you. The Battle for Atlantis is one of the big, in the Bahamas. That’s one of the biggest preseason or kind of out of conference tournaments that there are. That’s going to be a whole lot of eyes. Playing well against Oklahoma, and then whoever they keep playing after that, I think that will be big. Playing West Virginia, I think, is going to be a really good game. They play that one in Madison Square Gardens. Any time you have the chance to play those kind of neutral site games I think is awesome. You look at two years back, when Florida played Duke in New York City, and then they ended up going there in the NCAA Tournament and have already played there. So, I think getting that kind of neutral site experience is very important. I that Butler, the last game of their nonconference season, I think that’s going to be really big, because that’s a really good opponent. It’s a team that brings a lot of really good guard play, and it’s also the last one they play before going into the gauntlet of the SEC. I think entering your SEC play on a win streak is going to be really important, because if you’re down on yourself going into the SEC you’re going to have a whole lot of tough games, and that’s not going to be the place to figure yourself out. Andrew: That’s not what you want to do. As we all have noticed in the past, that nonconference play is what ends up being the answer to a lot of seeds when it comes tournament time. Eric: Yeah. We’ve seen it time and time again. The NCAA has announced the net system for evaluating teams this year, which they haven’t said the formula for it, so it’s a complete mystery. Playing tough games, having a tough strength of schedule and having big wins, whatever the system is, that’s going to help you. Florida’s tough conference schedule has helped them the last two years get good seeds in the NCAA Tournament, so I hope they keep doing it. Andrew: Last thing for you. I’m going to put you on the spot here. If Florida is to make a deep run into the tournament, what are the keys? Eric: The key is that they’re going to have to score more efficiently. We saw them, especially down the stretch last year, it seemed like all we talked about on the podcast was how Florida would have a lead, and they would let it squander. I wrote about that last week, just about how many leads in the second half Florida squandered. It wasn’t because of their defense, because the defense was good. I think scoring the ball efficiently and being able to score the ball down the stretch is going to be massive. Then the other key I’ll say is point guard play. I really like Andrew Nembhard, but I kind of have to temper my own expectations, because he is a freshman. If you look at teams that went deep into the NCAA Tournament in recent history, there’s not a lot of them that did it with freshmen point guards. A lot of them did it with really experienced point guards. Florida will have to get a lot out of their point guard play, and Nembhard is going to have to play like a veteran and not a freshman. I mean, with his experience at IMG Academy, or not IMG, at Montverde, and then playing for the Canadian National Team, he should be really ready, more ready than a lot of freshmen. Point guard play will be key. I would also say if Florida were to underachieve somehow this season I think we might look at it and be like, without many veteran point guard options, that could have been what kind of made the team not successful. Those would be my keys. Andrew: Also, with Andrew, he should only be a senior in high school. Eric: That’s the other thing too. That’s a great point. He reclassified. The fact that he was supposed to be a senior in high school and instead is going to be the starting point guard on Day 1 against Florida State in Tallahassee, that’s really puts it into perspective. I’m glad you reminded me. Andrew: Eric, we appreciate it. Looking forward to it. Looking forward to a great year and some awesome recruiting and basketball coverage. Stay tuned to Gator Country for that. Eric, any final thoughts before I get you out of here? Eric: No. I’m looking forward to talking more basketball with you now, and I hope you enjoy your bye week. Andrew: We’re enjoying the bye week. Dan Mullen is doing well. Listen, I don’t think that one goes with the other. I tell people this all the time. Good football program helps Florida in basketball. Good basketball play helps Florida in football. Both of those guys can build off the environment. You guys with Mike White were able to bring guys in for football games, big atmospheres, and now that basketball is doing well, they’ll be able to bring in guys for big atmospheres in basketball. Eric: Yeah. I think people like being around greatness. I think even with the upcoming recruiting class that Florida is going to have they’re going to have some lottery picks in the NBA. I think it certainly probably doesn’t hurt for some of the football players if they can go workout with some future NBA players. That doesn’t hurt. Just having pros around, that is going to help sport to sport, at least I think so. Andrew: As they said, it was title town. It’s title town in Gainesville. Why not bring it back? Eric, we appreciate it. Guys, we’ll be getting back to talking basketball with Eric here as the season grows near. We’ll be getting back on a regular schedule. Follow Eric on Twitter, and follow him on Gator Country, as we’ll be doing a lot of basketball stuff. We appreciate it, guys, and we’ll talk to you guys soon. The 2000 class with Kwame brown, David lee, and James white….all 3 were 5 star and ranked in top 10. That the best class ever?